The Art of War meets The Artist's Way in this no-nonsense, profoundly inspiring guide to overcoming creative blocks of every kind. Exactly what the title says. Think of The War of Art as tough love … for yourself. It tells you how to define, understand, and defeat your own resistance to being a creative professional. What keeps so many of us from doing what we long to do? Why is there a naysayer within? How can we avoid the roadblocks of any creative endeavour — be it starting up a dream business venture, writing a screenplay, or painting a masterpiece? In this powerful, straight-from-the-hip examination of the internal obstacles to success, bestselling novelist Steven Pressfield shows you how to identify, defeat, and unlock inner inner barriers to creativity. 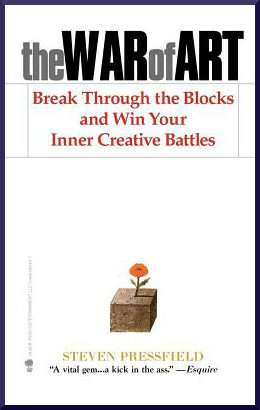 Subtitled Break Through the Blocks and Win Your Inner Creative Battles, this book is an inspirational, funny, well-aimed kick in the pants that shows how to reach the highest level of creative discipline. Steven Pressfield has been an enthusiastic golfer since the age of ten. His debut novel, The Legend of Bagger Vance, was made into a movie starring Matt Damon and Will Smith. He is the author of the hugely successful historical novels Gates of Fire, Tides of War, and Last of the Amazons. and a well-known screenwriter whose screenplays include Above the Law and Freejack. A former Marine, he lives in the Los Angeles area.